Alan Paton was a man who did not believe in the South African Nationalist's idea that any race should be discriminated against, simply because of the colour of it's skin. It was this belief that inspired him to start a political party opposing those ideals. On 26 May 1948, the National Party, under Dr D F Malan, with the support of most Afrikaners, defeated the United Party under General Jan Smuts, to become the government of South Africa. The Nationalists set about implementing their policy of racial segregation, or apartheid. Whites were to be kept separate from blacks, Indians and Coloureds in all areas of life - housing, marriage, schooling, hospitals, transport and entertainment. Each race group was to develop its own separate identity. Legislation was passed to support the apartheid policies - in 1949 the Immorality Act; in 1950 the Mixed Marriages Act, the Population Registration Act, the Group Areas Act and the Suppression of Communism Act. The official opposition to the National Party was the United Party. The unofficial opposition was the very strong Congress movement, which was composed of the African National Congress (ANC), the South African Indian Congress, the South African Coloured People's Organisation and the white Congress of Democrats, which had taken the place of the banned Communist Party of South Africa, and the Liberal Party of South Africa. Liberally minded opponents of apartheid formed themselves into various liberal groups, who in 1953 came together to form the South African Liberal Association. There were four vice-presidents: Margaret Ballinger, Edgar Brookes, Leo Marquard and Alan Paton. On 9 May 1953, the Liberal Association formed itself into the Liberal Party of South Africa. The first president was Margaret Ballinger. Leo Marquard and Alan Paton were vice-presidents, Oscar Wollheim was chairman and Leslie Rubin was vice-chairman. 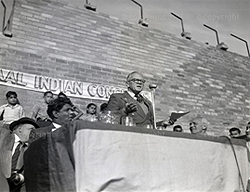 Alan Paton president of the LPSA addresses a crowd in Fordsburg, 28 July 1957. That no person be debarred from responsibility and participation in government by reason only of race, colour or creed. (Are you sure you are not a Liberal?, LPSA pamphlet; based on the Constitution of the LPSA, which can be found in Non-racial democracy: the policies of the Liberal Party of South Africa by Alan Paton). The LPSA started by having a qualified franchise, which was soon dropped for the universal franchise. It aimed to abolish the colour bar, repeal discrimination and repressive legislation, make education available to all,, establish and maintain freedom of movement, freedom of political and trade union organisations and freedom to own and occupy land, and to extend health and welfare services to provide adequately to all South Africans. The LPSA advocated a controlled constitution in which a Bill of Rights would be entrenched. The LPSA was against violence, and wished to use only constitutional and democratic means to achieve its objects. The LPSA gained a multi-racial membership, and was seen as a threat by the National Party. Many of its members were banned or put under house-arrest and its meetings were attended by members of the Security Branch, who also followed some of the members - they followed Alan Paton, listened to his telephone calls, read his letters and searched his house for many years. In 1966, the Prohibition of Improper Interference Bill was created to prevent interracial political collaboration, and to put an end to both the LPSA and the Progressive Party. When this bill became the Prevention of Political Interference Act in 1968, the Progressive Party opted to become a whites-only party, which for many years had Helen Suzman as its sole stalwart opposition member of parliament. The Liberal Party decided to close, as to break into separate racial parties would betray the very principles which it had came into being to uphold. Closing meetings were held all over the country in April and May 1968 (From Alan Paton 1988 Journey continued: an autobiography).